Still contemplating something to make it more worthwhile for the "beginners". It will all depend on whether or not we have more drop outs. How about introducing a handful of new "prizes" for each round? Then - someone who places 4th down to 11th still has a chance of earning an accolade, even if that does not necessarily result in them finishing in the top 3 for that challenge? Maximum points for judging is 30, and then you could have, say, 3 bonus points per "Best" category, for a maximum of 42 if there's four. Sure - the top three might collect the "Best" prizes each round - but who knows? One round, the entry placed 6th may have actually had the Best Ride, and therefore gets 3 bonus points. It might be a bit convoluted for the number of contestants. If it were bigger that might be cool. I think it’s time for me to drop out. My ideas don’t seem to be conveyed enough in the photos I’m posting. Maybe my ideas aren’t strong enough or my ideas aren’t well thought out enough. Good luck to all those remaining. Please let me know if you have any questions or concerns about my comments. Wow - Salad Fries - runner up?! I'm humbled and touched by your comments, too. Please don't! It's clear to me that there are three better builders than me (at least) in this competition, but the feedback I get keeps me going. Please do reconsider, if you can. It's a terrible shame to lose people so early on. Please stay in the game! Your screenshots were amazing. 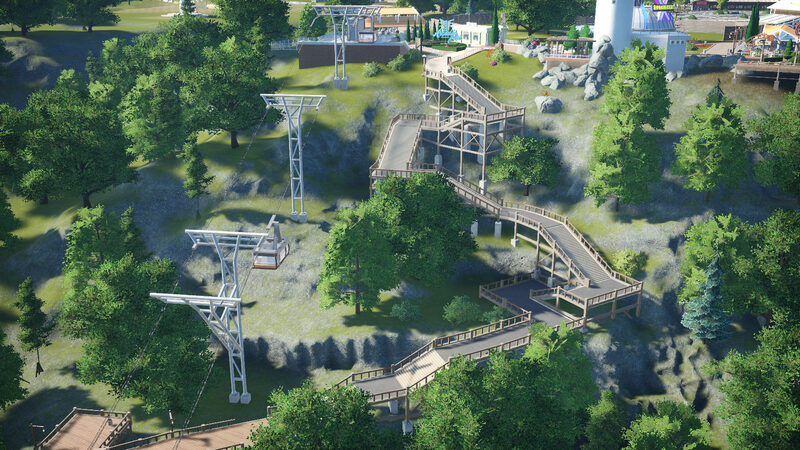 I really want to see how you develop the park. Thanks for putting me in first! 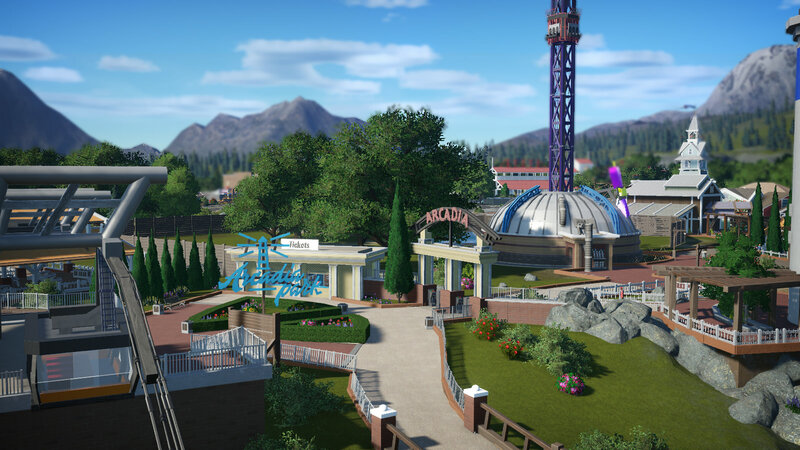 And great job to all the other contestants who entered, you all had something great in your parks. And thank you for all the nice comments from the judges and fellow competitors alike. DragsterDan, you should still strive to be in this competition. I know that you are a great builder and once you build up your park more it will definitely shine. I freaking loved your second entrance, that was gorgeous. I don't want to get up on my soapbox and make anyone feel bad, but I think it is very unsportsmanlike as well as unfair to the other contestants, to drop out of a competition like this. This should be fun, as well as a learning experience. If you've only entered to win, then it's likely you aren't going to have fun, and you're setting yourself up for frustration. The more people drop out, the fewer contestants are left, making these competitions much less enjoyable. And I, for one, enjoy viewing ALL the entries...the good ones, the bad ones, and everything in between. I love seeing the newbies take on the challenge, and watching their work improve. I love being blown away by the top notch designers too. And I love seeing how each individual takes on each challenge, and how different each park ends up looking. I remember the last competition, when we had 2 tiers, the 2nd Tier contest (the beginners & casual players) was much more fun and exciting then the 1st Tier (the experts). It's still up in the air whether or not this competition will split into 2 tiers. If members continue to drop out, then it won't. If everyone stays in, then there's a good chance that it will. Well I also work about 70 hrs a week. So unsportsmanlike was not really at the forefront of my mind. Was just stating my opinions on to why I might want to leave. Plus I feel like my building style isn’t cohesive enough like the other players. Maybe it’s just my lack of skill this time around. I would definitely reconsider, Dan. You can work on the park when you have time. I know I, and several judges, were very impressed with your work. When I'm looking at the entries, I try to take the skill level of the member in mind. It's only fair to try and judge that way. Each and every entry brought something very interesting to the contest, even the "less experienced" players. PM me if you would like my breakdown. Before I forget I do want to thank each and every one of you that thinks I have a good building style, or likes what I do and has offered their positive words. I literally just keep looking at all the different buildings I have in the park so far and they all make me cringe. Nothing has a style nothing fits and nothing seems to be clicking for me. Maybe that will change, maybe not. Who knows. And also, congratulations to all the entries and of course to the winners. Y'all deserved it so much. 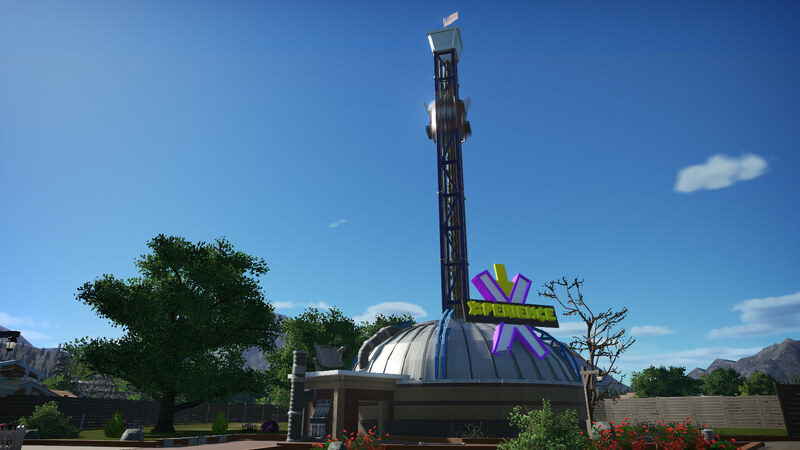 I cannot wait to see what everyone has up their sleeve for a coaster. Wow. I'm shocked to have scored so well with what was far less than a maximum effort due to time constraints. I feel like I pulled off a bluff in a poker game but this isn't poker, it's hale fellows well met, so I feel like I stole a march. Still, I can't complain about the points so thanks to the judges who liked my stuff more than I did, but my apologies to my fellow competitors whom I think should have ranked above me this time. In any case, congrats to the real winners and everybody else. I thought all the entries (except mine) this time around were better than in C#1. Yes, that's a functional hotel of 40 rooms, 30 regular and 10 luxury. Because the room boxes are 4m and I scaled the tower floors to 3m, they overlap inside but the peeps don't mind. And while I suppose the spiral tram track isn't realistic, I got the idea from Disney's Head and he's spent most of both his lifetimes flaunting reality for all he's worth, so that many now worship him as a god, the modern pharaoh. If you say the silly beach-only tram station must remain, then it shall. I'll even pimp it out a bit if that's the case. It's still a silly requirement, though. At the tragically conjoined twins of Blue Bayou (water park) and Dixie Landin' (unthemed amusement park), 1 price of admission lets you do as much of both as you want. I'm pretty sure 6FoD works that way, too, with its conjoined water park twin. So that's how I think this place should operate. You're too kind as well but closer to my own feelings. Wow. I'm shocked to have scored so well with what was far less than a maximum effort due to time constraints. Frankly, I was shocked as well. This was a tough challenge to judge, as I believe some entrants found the requirements confusing... or simply annoying (Bullethead?). I don't think there was any one entry that was the obvious winner. I chose champ01, because I thought he simply did an elegant job of meeting all the requirements. It was all very logical and realistic. And that cable car ride was pretty impressive. 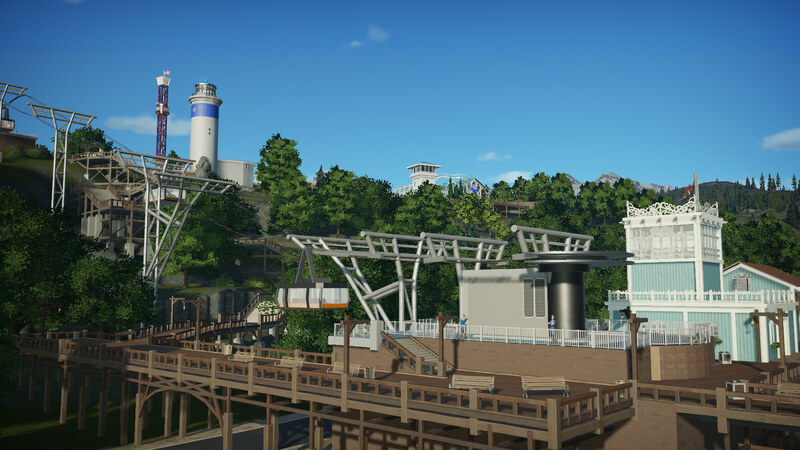 JPAlmighT, I think, was a bit confused on the requirements, but like always, still managed to submit an excellent entry, showcasing his talents in park design. PhDisney may not be as skilled a builder as my top 2 choices, but the imagination and creativeness of his entry awarded him 3rd place from me. As for the runners up, FCP-Rug continued with his usual, competent skill, and Bullethead's entry was, if anything, creative. I'll throw you under the bus a bit for my confusion Shyguy -- when people were asking questions when the rules were announced, I said I felt like the main thing was that you wanted to see us connect the park and the beach via that hill, and you confirmed. Granted, I didn't mention the beach only path (I must've missed that requirement when focusing on the other rules.) But as I said before, even if I understood properly I might have still intentionally avoided making that path. Not enough real estate available to give up park land (and not even parking available to let the beach folk use it for free.) Bullethead has articulated all of that so I'll stop there. If time allows it may be possible for me in challenge 3 to get you that path without sacrificing park land, just so I can feel like I'm caught up with everyone. Thank you for the nice comments. Thanks again for the feedback Salad Fries! Yeah, I was not at all happy with my transport up to the park either, I struggled hard on that. My initial plan was to make that hill path a road up to the park for the bus but I just didn't appreciate it enough. Actually, I have had a lot of feedback on the butterfly house but that was the biggest let down for me. I hated the dome at the back so much that I have remade it and am much happier now! It was too small before and that just didn't work for me at all. Congratulations to all the contestants great work! LMAO. I'll add pillows to my park. After I add sidewalks. I'll throw you under the bus a bit for my confusion Shyguy -- when people were asking questions when the rules were announced, I said I felt like the main thing was that you wanted to see us connect the park and the beach via that hill, and you confirmed. I agree that the original goals could be interpreted different ways. I tried to state it in a simple, very understandable way. But upon reading it a couple days later, it was pretty clear to me how "unclear" it was. You only need one pathway to the beach. I meant for the back entrance to the park to be at the top of the cliffs. But I would have no objection if you wanted to create your second entrance at the beach level, although I think that would make things more complicated and would probably require a second walkway for non-park goers. Next time though, any clarifications on my part will be added to the challenge's original post, so entrants don't have to read through the entire thread to understand the goals. But in the end, I think the judges were fairly lenient on how the entrants interpreted the goals. Congratulations at the winners! Well deserved! To Salad Fries and wowmanrct: Thank you both for your feedback, much appreciated. The advice you are both giving me is the same as my own feeling: my buildings are to plain. So i agree on that. Ill try to work on that in challenge 3 and see where it leads me. Sorry thanks to wowmancart too! Didn't see the feedback earlier! Thanks to the judges, and congratulations to the winners! I want to weigh in on the tier thing: I honestly think I would prefer that we didn't split into two tiers. I think I learn a lot more by directly competing against everyone who is more experienced than I am than I would if it was split. I'm not super competitive, though, so I don't mind being in last place. congratz to the winners.. gosh now i need to get activ with 3 challenges :S fuak i hope i will find some time after this week, i think then it will be a bit quiter at my plaace.. i WILL participate in the summer challenges!!!! i WILL comeback! congratz to the winners.. gosh now i need to get activ with 3 challenges :S fuak i hope i will find some time after this week, i think then it will be a bi quiter at my plaace.. i WILL participate in the summer challenges!!!! i WILL comeback! What's new in Arcadia Park? Oh but look: a brand new drop tower, 40 meters high. X-Perience tells you an experience that goes wrong and sends you into the air. 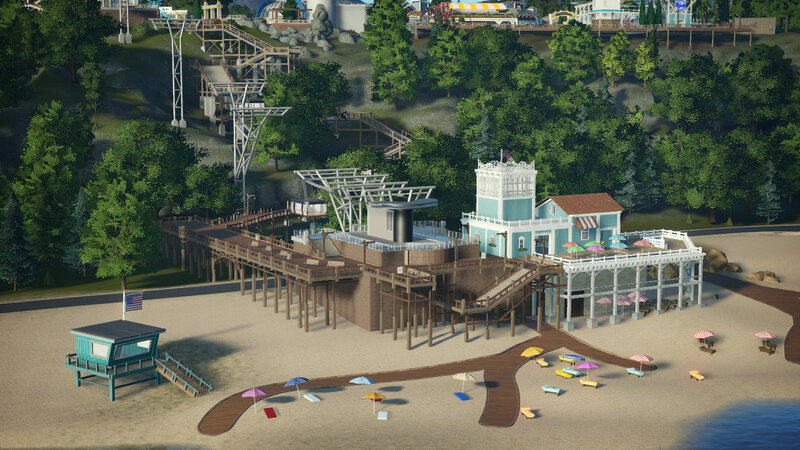 Next to this new attraction which is located opposite the lighthouse, the park has built a second entrance. Indeed, the city asked to create an access for the beach from the top of the cliff. 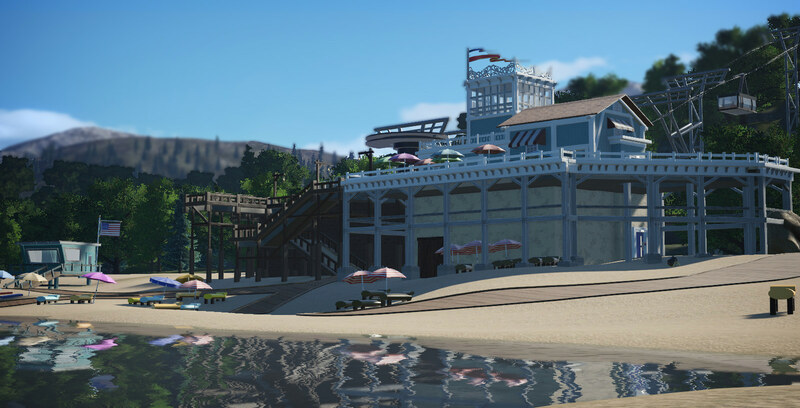 The park has developed two ways to reach the beach. The first is a simple path and stairs that have been built with the aim of disfiguring nature as little as possible. The other method (thought for people whose physical condition does not allow them to climb so many steps) came to mind after a trip to Madeira. He remembered a beach accessible via a cable car. On the beach a small pier has been built (with an information point and a restaurant) as well as a small car park. The rest of the beach was little affected so as not to distort the Lake Planco.